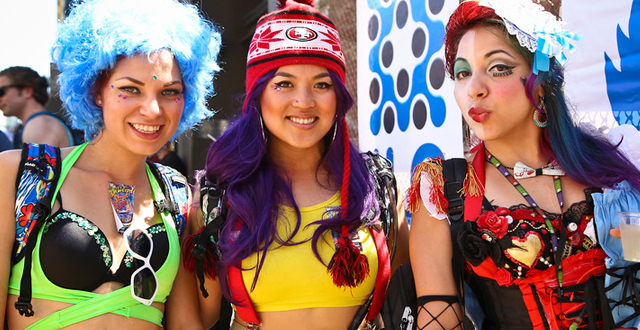 On May 6 San Francisco receives another edition of How Weird Street Fair (HWSF). Lasting only one day, this event is known as an incredible spectacle that brings to the city thousands of people from around the world to celebrate peace, criativiy and weirdness, being also considered by many the start of San Francisco's street fairs and outdoor events season. HWSF was created and is currently fund-raised by World Peace trough Technology Organization, which describes it as "an experiment in creating peace". It features 10 stages with music performances, workshops, booths set up by several charities with information about topics such as peace and sustainability, vendors from all over the world and live and exhibited art work in an area called the "Art Alley". Some notorious speakers like R.U. Sirius, Joe Firmage and Craig Newark (founder of Craigslist) have participated in conferences about technology and peace during HWSF. The festival also claims to have the longest running electronic music street festival in North America, showcasing diverse forms of dance music, such as electro, trance, house, techno, dubstep, drum&bass, and world beat. The theme for 2018 is "Disco Ball Inferno", which intends to be a parody of the 1970's, and provide a "very groovy time" for participants. HWSF is proud to host some of the best DJs and sound systems on the planet, as well as a variety of artists from other music styles. HWSF 2018 does not disappoint, with highlighs going to artists like like Tandava, Random Rab, Nikka T, Guidance, Christafari, Ll, Conandrum, Christian Martin, Nas-Ja, KarmasynK, DJ Seven, Jef Stott, Symatics, Paul London, EliKi, Syd Gris and many others! In 2018, How Weird Street Fair will be in 6 of May and you surelly don't want to miss one of the most emblematic events of San Francisco. You can check the full festival lineup and more in How Weird Street Fair page here!